What does short interest tell you about a stock? What does Short Interest tell you? As the saying goes, a picture can speak a thousand words. This chart pretty much sums up my entire article, and answers the question posed in the title. So I thought I would post the ‘punch-line’ right at the beginning. Now let’s rewind a bit. As “investors”, we like to think we have some inherent advantage over most people in the market, which is made up of traders and short term thinkers. We think of ourselves as the rational ones who keep a level head and objective approach even in the midst of fear and crisis. Books like the Intelligent Investor by Ben Graham, and gurus such as Warren Buffett make out like the market as a whole is irrational, disregards company fundamentals and can be taken advantage of. But there is an important point which is easy to miss among this self congratulatory rhetoric, and that is that Mr Market, far from being incompetent, is usually right. It is only on occasion that he is irrational and will offer you the proverbial $1 for 50 cents. In this article I’m going to explore what the ‘short interest’ in a stock tells you from the perspective of going long (i.e. it’s not about shorting stocks). Most good investors will tell you that they discard over 99% of the companies they look into, and there is a reason for that. Some may be because they are outside the circle of competence, but mostly it’s because the market isn’t undervaluing the company. More often the market fairly or even overvalues them, rather than undervalues them. In our search for good investment ideas we look in a lot of places to find suitable companies, including stock screens. A popular screen to look for bargains in is stocks with a high short interest. Websites like this make it easy to find them, and they are usually cheap so look very attractive on a fundamentals basis. Short interest is the % of the shares that have been sold short. This means some investors have borrowed the shares, and are paying for the privilege of being short. Such borrowing and selling drives down the price of a stock. From this we can infer that if the short interest is high, then Mr Market thinks the company is overvalued. Remember that this is the same Mr Market that overvalues companies frequently, and I would argue has a bias to overvalue and be overly-optimistic on stocks. So when pessimistic on a stock, to the point people are paying for bets against the company, then you’d better take notice, because there is something perceived to be wrong. What a high short interest does not tell you is that a share is undervalued, or is even more likely to be undervalued. Many value investors think that a high short interest is attractive, because it means there has been more selling pressure on the stock, and there is the likelihood of quick gains if there is a short squeeze. Even I am guilty of thinking, and even suggesting that high short interest is something to seek rather than avoid. But I, and others, were wrong. In fact when it comes to short selling, Mr Market is usually right. I wanted to test the theory I previously held (that high short interest stocks are an attractive place to look for investments) so I ran backtests of various model portfolios which choose stocks solely based on their short interest. The first backtest selected stocks that have greater than 20% of the float short. The second backtest selected stocks that have less than 0.1% of the float short. The third was just all US stocks in equal position sizes to correct for the bias with comparing to a benchmark like the S&P 500. All these portfolios excluded over the counter stocks, were reinvested every 4 weeks and contained more than 100 stocks (so not based on small sample sizes). The results speak for themselves. Contrary to the opinion of some, I would argue from this that a high short interest in a stock is a bearish signal, the high short interest portfolio lost 63% in total over 12 years, a dreadful performance. Compare that to the staggering 670% (or 18% p.a. compounded) return of the low short interest portfolio and it is fairly clear that short sellers, on the whole, have been correct in their pessimism. Moreover, they don’t tend to short the biggest winners. The stocks with a tiny short interest returned double that of US stocks as a whole. I then re-ran the backtests with an additional filter to select only companies with a market cap greater than $250m, to see whether microcaps where affecting the results. I also adjusted the low short interest to 0.5% to keep the sample size up. The returns did converge slightly, however the pattern is the same. The pattern also holds true when the ‘high short’ threshold is changed to 10%. Though returns do increase slightly, it is still below the S&P 500 returns. Does this mean that you should never buy a share with a high short interest? Strictly speaking I would say no, but your average investor would clearly do well to avoid them as a rule. I would say this means that if you are buying a position that has a large short interest then you need to have a very good, concrete reason, and not simply choose to ignore rumors, even if they apparently have little factual basis. 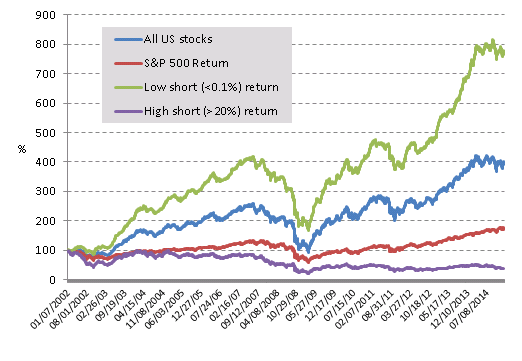 Understanding the reasons for high short interest has never been easier, with websites like Seeking Alpha usually already having articles spelling out the short thesis on most heavily shorted stocks. For the rest, searching the news using Google will often allow you to quickly understand the pessimism around the shares. So does this mean you should only buy shares with a tiny short interest? Again I would say no, but avoiding any meaningful short interest would serve the average investor well. The main lesson I personally will take from this analysis is that searching heavily shorted stocks for investment ideas isn’t a great use of my time, and excluding heavily shorted stocks from my screens will probably allow better, more focused investment prospects. 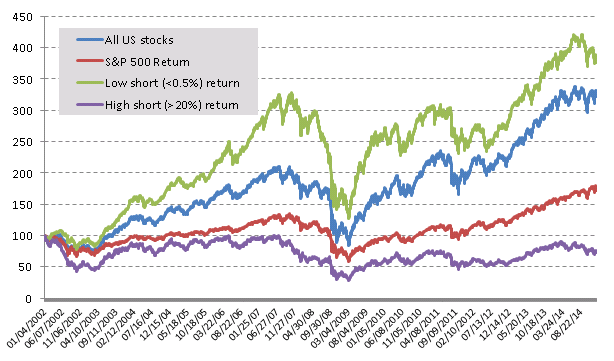 The group of shorted stocks likely hold fewer good investments than the market as a whole, and if their problems could be ignored or explained away then the market would have already done it. I, as an individual, am unlikely to have a unique insight on a company’s situation, and the same probably applies to you as well. Does this mean you hold the stocks only for 4 weeks and when the short ratio goes down, its out? Doesn`t it make more sense to just buy the stocks and hold for 12-24 month for a backtest to really see the impact? Yes it means every 4 weeks the short interest for all stocks is calculated again and those that have moved outside the boundaries are removed from the portfolios. I tried various time periods from 4 weeks to a year and the pattern was always the same, though returns are obviously a bit different. The high short interest consistently loses money over 12 years and the low short interest beats the market. Thank you for this very interesting analysis. Part of the explanation to this statistically significant bias could be explained by the assymetrical positions of long and short holders on a theoritical stock priced today at 100. The best outcome for the long is that the company grows, or is taken over, and the gain there is potentially much higher than 100. In my view, taking a short position is therefore more risky because of the theoretically capped upside, and is therefore a stronger statement than being long, which would imply more research on the underlying stock, or a strong anticipation of bad newsflow (I did not say insider!). I have a side question for you: which system are you using to backtest your hypothesis (Bloomberg?). Thanks again. I agree, a short position requires more conviction and is more likely to be a sophisticated investor, not only because of the capped upside and unlimited downside, but you are actually paying the borrow cost to keep the position open too. Interesting article thanks. I generally avoid heavily shorted stocks just from experience but good to see how the figures show what I’ve found. My question is, did you adjust the returns to bid-ask spreads and brokerage commissions? As I see the portfolio is rebalanced monthly. Many stocks have bid-ask spreads of 3-5% (or even higher), so you can’t practically buy/sell them on a monthly basis (and making a profit too). And I forgot to say, that short interest is usually posted on major exchanges with a delay of at least 2 weeks, so this delay has to be introduced in the backtesting algorithm too. Can you tell me what are the results if you rebalance the portfolio on a half-yearly or yearly basis? I think it would be more realistical to see those results, since that could be implemented in the real world too.